Other Products: Fine liner Black, Cardstock Black, Cardstock White, Golden Rub on letters, Treasure Gold, Rhinestones Blue, Letter B SVG file Silhouette store, Wink of Stella Clear, Versamark, Clear Embossing powder, Heat tool, Distress Ink Vintage Photo, Craft knife. Instructions: Take a piece of the paper from the paper collection, cut the B using the SVG file found here. When cutting the B, center it on the paper so that you still can use the remainder of the sheet. In the upper left corner there is a rose on the paper, cut it along the bottom of the rose, using the craft knife, allowing you to slide the black cardstock underneath it. Cut the Black Cardstock at 11 1/2 x 11 1/2 inches and glue this on your sheet. Now glue the letter B on top of that. Take your Fine Liner and make a nice stitched edge on the letter B. Cut 2 butterflies out of the paper collection and put Versamark on them, and on top of that Embossing powder. Melt that with the heat tool, then lightly shape the wings. Finish them off with some Treasure Gold. Put 2 pink stamens behind the Butterfly for his Antenna. Stamp the large and small peonies with Rhubarb Stalk on white cardstock and cut them out with the coordinating die. Color them with Peanut Brittle in the middle and the rest of the flower with the Pearlescent Poppy. Shape them with the Deluxe Shaping mat and tools. 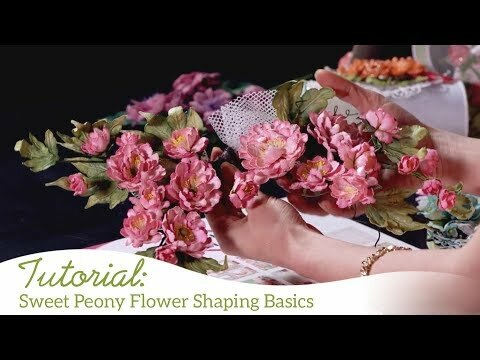 Make 2 large flowers, 1 medium, 1 small and some tiny filler flowers. Pierce a hole in the flower centers with the paper pierce from the deluxe flower shaping kit and put some stamens in. For the smaller flowers you can do 1 big stamen. Stamp with Tuxedo Black some Rose Vines, color them with the New Sprout, Bamboo Leaves and a little bit of the Vintage Photo inks. Cut them out with the coordinating die and shape them with the Deluxe shaping mat and tools. Glue all of the flowers on the left bottom of the letter B and make a nice arrangement, put a few leaves on top under the rose shape. Glue one butterfly on the right upper corner off the letter B and give him a nice body with a kind of rhinestone shape, then the second Butterfly goes on top of the flower arrangement. Take the Rub on letters and make the word butterfly. On the edge of the page, put some Wink of Stella Clear, also on the flat rose. On the large peonies I put also some Treasure Gold, you can apply it with a sponge or your finger. Finish your lay out with some blue rhinestones.